The registered nurse provides supervision for patient services, makes assessments and performs treatments, keeping in touch with the patient, family and physician. RN JoEllen Bourgeois checking patients pulse. Terrebonne Homecare, Inc. employs two, full-time Wound Care Certified nurses to observe and manage the healing of different types of wounds. Our patients are evaluated and assessed by a wound care nurse and recommendations for treatment are made in collaboration with the patient’s physician. We specialize in the healing of diabetic ulcers, venous/arterial ulcers, and pressure ulcers. 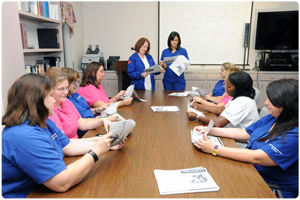 Our skills include, but are not limited to, wound vac therapy, topical dressings, and patient education regarding wound healing. A certified nurse aide provides assistance with personal hygiene and home management services supervised by the registered nurse. In-home IV therapy provided by a skilled nurse for short or long-term management of pain medication, antibiotics, hydration or other drug therapies. Licensed occupational therapists provide goal-oriented activity to patients whose functions are impaired by illness or injury, congenital or developmental disability, or the aging process. 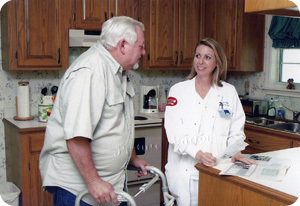 In-home diagnostic and therapeutic services assist the patient to communicate more clearly. In-home services to improve physical mobility and function, provided by licensed physical therapists. Social workers help patients and families with social and emotional needs, which may interfere with the patient’s medical care or recovery. 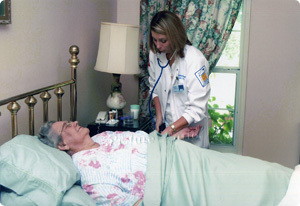 Nurses are available 24 hours a day 7 days a week for medical emergencies that may occur in the home for the care of the patient.